I gave this talk at the International Internet Preservation Consortium‘s 2015 Annual Meeting on Tuesday, April 28th (Stanford University, Palo Alto CA). Hopefully you find it interesting, even if it is lacking my narration. Last post (three day conference deserves three posts, right?) for my trip to Hannover, Germany for the “Big Data in a Transdisciplinary Perspective” conference. I had the opportunity to sit down with Daniel Meßner, who hosts a podcast called Coding History. I really enjoyed our conversation, and wanted to link to it here. You can listen to the podcast here. Hopefully I am cogent enough! It grew out of my lightning talk and poster, also available on my blog. My thanks again to the VolkswagenStiftung for the generous travel grant to make my attendance possible. It was a wonderful conference. I was fortunate to receive a travel grant to present my research in a short, three-minute slot plus poster at the Herrenhäuser Konferenz: Big Data in a Transdisciplinary Perspective in Hanover, Germany. Here’s what I’ll be saying (pretty strictly) in my slot this afternoon. Some of it is designed to respond to the time format (if you scroll down you will see that there is an actual bell). If you want to see the poster, please click here. Big Data is coming to history. The advent of web archived material from 1996 onwards presents a challenge. In my work, I explore what tools, methods, and approaches historians need to adopt to study web archives. GeoCities lets us test this. 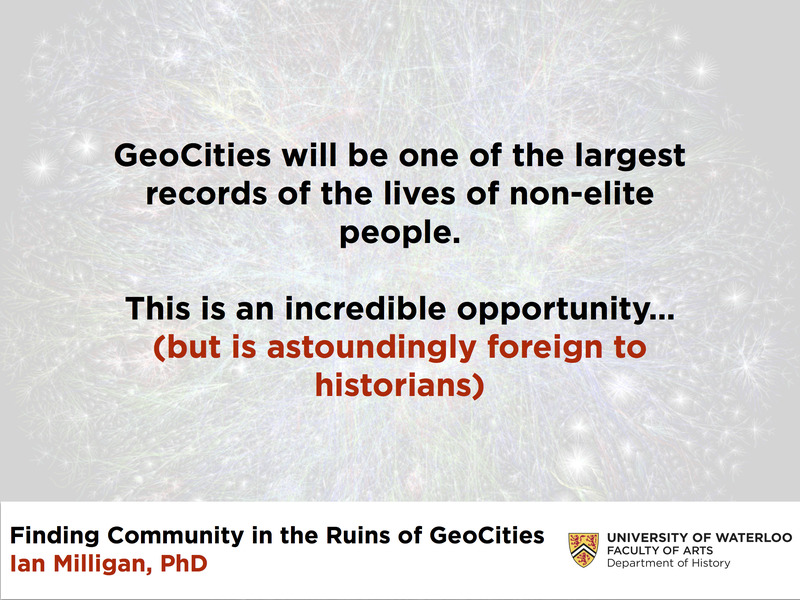 It will be one of the largest records of the lives of non-elite people ever. The Old Bailey Online can rightfully describe their 197,000 trials as the “largest body of texts detailing the lives of non-elite people ever published” between 1674 and 1913. 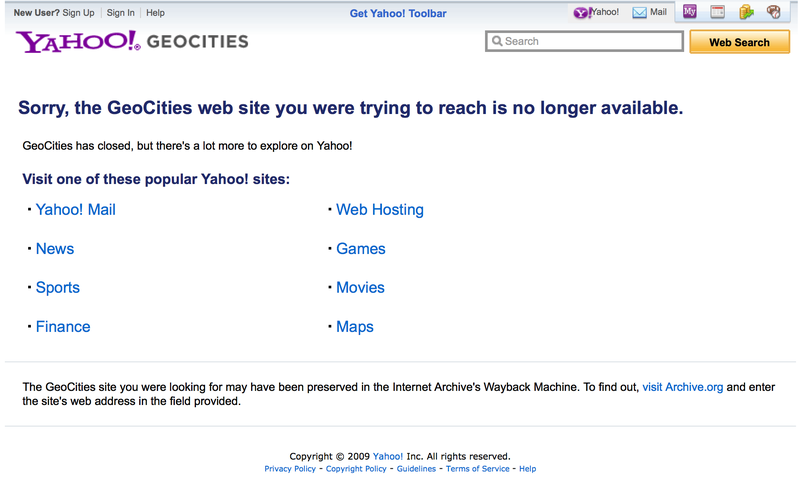 But GeoCities, drawing on the material we have between 1996 and 2009, has over thirty-eight million pages. A low-resolution version of the EnchantedForest visualization. Read on for higher-resolution downloads. ImagePlot, developed by Lev Manovich’s Software Studies Initiative, promises to help you “explore patterns in large image collections.” It doesn’t disappoint. 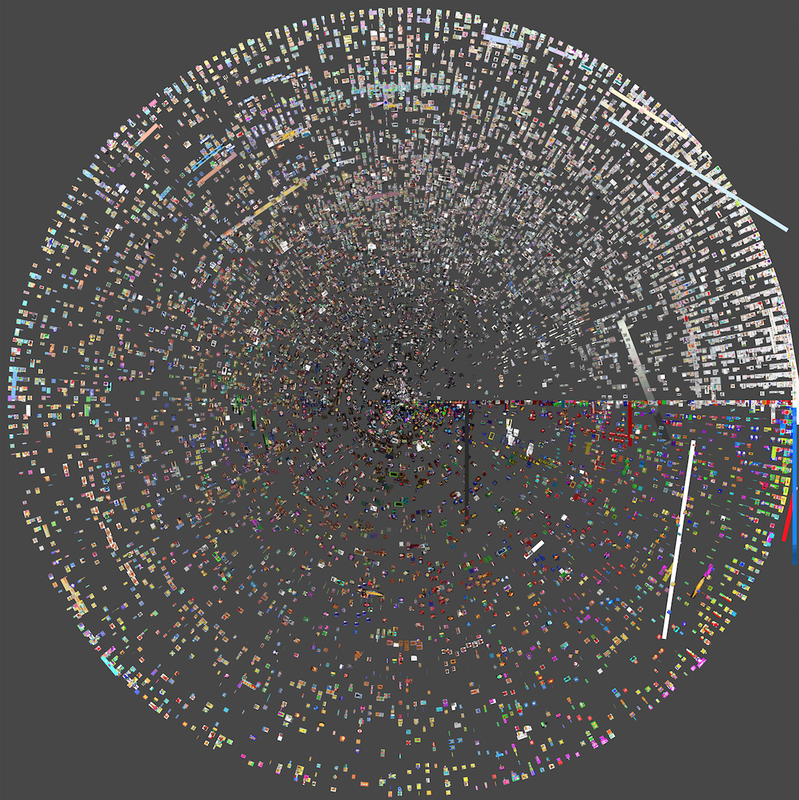 In this short post, I want to demonstrate what we can learn by visualizing the 243,520 images of all formats that make up the child-focused EnchantedForest neighbourhood of the GeoCities web archive. 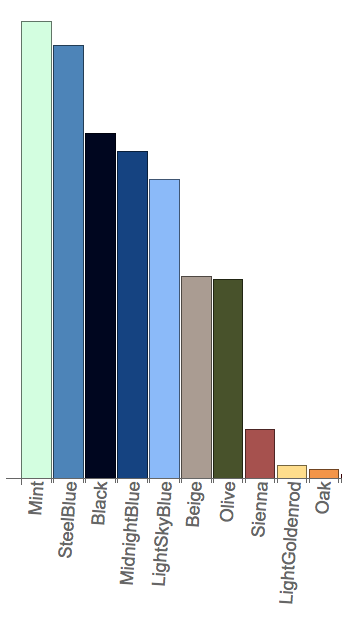 These popular colours from the children-focused area of GeoCities would look great on a paint swath, right? I have been tinkering with images in web archives – an idea that I had was to pull out the colours and see how frequent they were in a given web archive. With some longitudinal data, we could see how colour evolves. In any attempt, by running enough analysis on various test corpuses and web archives, we could begin to get a sense of what colours characterize what kind of image collections: another method to ‘distantly’ read images. This is easier said than done, of course! I did a few things. First, I began by getting average RGB values from each image using ImageMagick as discussed in my previous post: this was potentially interesting, but I had difficulty really extracting meaningful information from it (if you average enough RGB values you begin to be comparing different shades of grey). This is the least computationally intensive route. I might return to this, by binning the various colour values and then tallying them. The second was to turn to an interesting blog post from 2009, “Flag Analysis with Mathematica.” In the post, Jon McLoone took all the flags of the world, calculated the most frequent colours, and used it to play with fun questions like ‘if I ever set up my own country, I know what are fashionable choices for flag colors.’ It’s actually functionality that’s been incorporated to a limited degree in Mathematica 10, but the blog post has some additional functionality that’s not in the new fancy integrated code. I have been exploring link structures as part of my play with web archives. My sense is that they’re a useful addition to the other tools that we use to analyze WARC files and other collections. The difficulty is, of course, extracting links from the various formats that we find web archives in. We can get a sense, at a glance, what the structure of the website was; and, more importantly, with lots of links we can get a sense of how cohesive a community was. For example, with GeoCities, I am interested in seeing what percentage of links were inbound – or to other GeoCities pages – or external, in that they went elsewhere. This can help tackle the big question of whether GeoCities neighbourhoods could be understood as ‘communities’ or were just a place to park your website for a while in the late 1990s. As Rob Warren pointed out to me, network visualizations aren’t always the ideal case in this – sometimes a simple grep can do.